Do you dream of a place where you can look out at the mountains, wander among tall trees, and relax in a meadow? Your dream has become reality, and you can be a part of it. In collaboration with Seattle Parks & Recreation, we have transformed a unique, half-acre view property into a community park. Where: Meet at the park. Let's get together and do some light grooming and weeding. Tools: Hand tools and gloves furnished, or bring your own. Snacks: Cookies, iced tea and coffee. Donations always appreciated. Check out our Adopt-a-Spot Program. A new way to contribute your gardening interests on your own time! 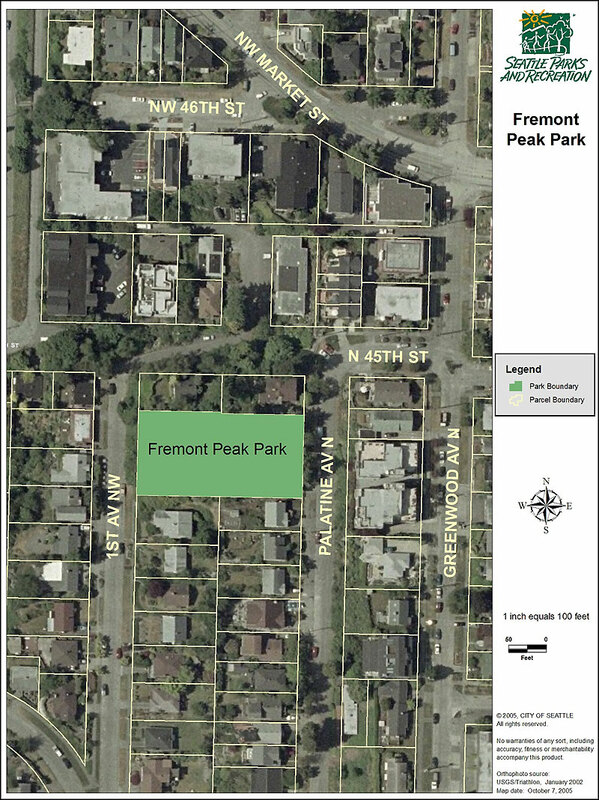 Now is an exciting time as the Friends of Fremont Peak Park are an active and committed community of nearby neighbors, nature lovers, and park enthusiasts. The Friends of Fremont Peak Park (FoFPP) is a non-profit, neighborhood-based, volunteer organization dedicated to the creation and stewardship of Fremont Peak Park. Read a description of the park design and take a look at the landscape plan.